I sat after school today with my Associate Teacher. We got to talking about the things I am trying out in my class and the general "how'd that go's" that go along with our conversations. During this particular meeting, I was sharing an idea I was about to implement in my classroom routine. This post in not about the idea itself, though I will explore it further in a later post (note to self: post about that idea of yours), instead this is about the discussion that ensued. "What is the real purpose of a blog for teachers," I was asked? What did I say, you ask? Well, the answer came rather readily. It's an incredible and boundless means to share ideas and find inspiration in those ideas of others. Pretty good, eh? I explained that for a teacher, it is a way to tell their colleagues about things that worked really well for them. For the readers, it is a way to find help and ideas as they endeavour to improve their practice. For both, it is a means for connecting to professionals worldwide and improving our teaching concertedly. Shortly after we called the meeting kaput, I remembered an argument about how people use the internet. I have no idea what terms were used, but essentially people can publish information, access it, or both. The speaker commended the internet for the people who fall into the latter, wasn't convinced that the former even existed (like an author that doesn't read), but was quite dissappointed to say that most internet users fell into the middle category. Whatever the speaker called those people (yes, I was one of them), it was not a nice word. He said it was an injustice to take without giving and a small part of me felt guilty for a moment. And then I got over it. Today that guilt returned and I rationalised it by saying I didn't have anything that was really worth sharing. As you can see by the founding of TwistofLiam, I wasn't convinced and now I am doing something about it. So, back to TwistofLiam. What will we find here? Well, that's as much for you to decide as it is for me. If you have something to share, bring it! A comment about something you tried (found here or elsewhere), fantastic! I will share here so long as I know someone is reading. I'll know someone is reading if they are adding to it, too. Afterall, you're not going to be one of THOSE people are you? I really like the colour scheme and the information was good too. I wish I wassn't doing report cards so I could spend more time reading. As teachers, we are told not to reinvent the wheel, but we sometimes find other peoples wheels roll more smoothly than the ones we are currently using. Keep up the good work! I too enjoy the color scheme and the information you have posted. 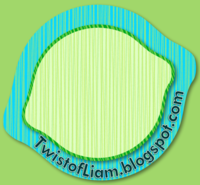 Great job on the clever title and drawing of "twist of Liam" The font of your blog is appropriate as well! If I had a suggestion for future posts, it is to watch your spelling :) I can see that you are very excited to share your ideas and information with others and you may be writing faster than you can think ;) You are very intuitive and a great teacher. Keep up the great work, keep writing your novel, and keep sharing your successes! Thanks Anonymous...I appreciate the feedforward.